This article was updated on 30 January, 2019 to reflect the current state of the Angular and React ecosystems. Should I choose Angular or React? Each framework has a lot to offer and it’s not easy to choose between them. Whether you’re a newcomer trying to figure out where to start, a freelancer picking a framework for your next project, or an enterprise-grade architect planning a strategic vision for your company, you’re likely to benefit from having an educated view on this topic. To save you some time, let me tell you something up front: this article won’t give a clear answer on which framework is better. But neither will hundreds of other articles with similar titles. I can’t tell you that, because the answer depends on a wide range of factors which make a particular technology more or less suitable for your environment and use case. Since we can’t answer the question directly, we’ll attempt something else. We’ll compare Angular and React, to demonstrate how you can approach the problem of comparing any two frameworks in a structured manner on your own and tailor it to your environment. You know, the old “teach a man to fish” approach. That way, when both are replaced by a BetterFramework.js in a year’s time, you’ll be able to re-create the same train of thought once more. Before you pick any tool, you need to answer two simple questions: “Is this a good tool per se?” and “Will it work well for my use case?” Neither of them mean anything on their own, so you always need to keep both of them in mind. All right, the questions might not be that simple, so we’ll try to break them down into smaller ones. Does it fit well with my project? There’s another thing we need to take into account. 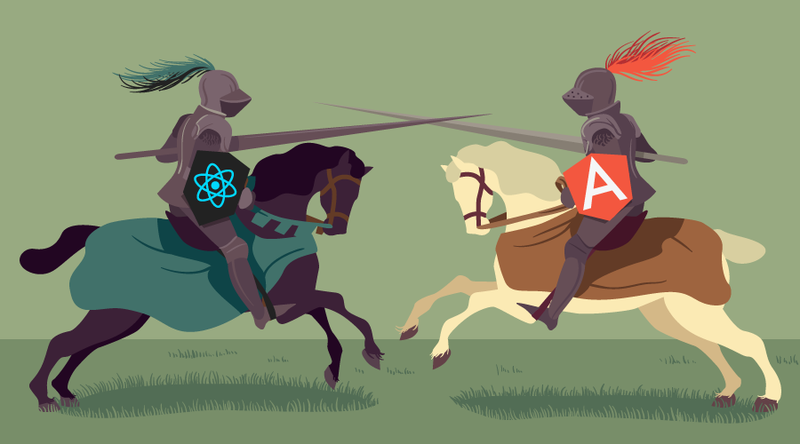 Strictly speaking, it’s not exactly fair to compare Angular to React, since Angular is a full-blown, feature-rich framework, while React just a UI component library. To even the odds, we’ll talk about React in conjunction with some of the libraries often used with it. The tool may be buggy and unstable. React is developed and maintained by Facebook and used in their own products, including Instagram and WhatsApp. It has been around for around five years now, so it’s not exactly new. It’s also one of the most popular projects on GitHub, with about 119,000 stars at the time of writing. Sounds good to me. Angular has been around less then React, but it’s not a new kid on the block. It’s maintained by Google and, as mentioned by Igor Minar, used in more than 600 hundred applications in Google such as Firebase Console, Google Analytics, Google Express, Google Cloud Platform and more. Some of these features are built-in into the core of the framework and you don’t have an option not to use them. This requires developers to be familiar with features such as dependency injection to build even a small Angular application. Other features such as the HTTP client or forms are completely optional and can be added on an as-needed basis. State management using setState and the Context API. We’ve found the freedom of choosing your own libraries liberating. This gives us the ability to tailor our stack to particular requirements of each project, and we didn’t find the cost of learning new libraries that high. There are several important things that come to mind when thinking about React: JSX, functional components, state management, PropTypes, and Flow. In React you can define components using functions and classes. Functional components are usually pure and provide a clear mapping between in the input props and the rendered output. Functional code is usually less coupled and easier to reuse and test. However, functional components in React have their limitations. For example, they cannot have a state as opposed to the class components. This requires the developers to switch between the two paradigms to make the best of both worlds. The situation will change when the hooks proposal is finalized and released. This will allow functional components to have a state and use other features of class components, such as lifecycle hooks. We will then be able to write purely functional React applications. The concept of state management is important for both frameworks and React has several approaches to offer. Each component can have its own state, so you can use that to create stateful components for holding the state of a part of the application. This is known as the lifting state up pattern. This, however, gets impractical as you need to store global state required in different parts of the application as well as manually pass data around different levels of the component tree. To mitigate this, React 16.3 introduced the Context API that allows you to make data available an all component tree levels without passing it around explicitly. Contexts don’t store the state themselves, they only expose the data, but if you wrap it in a stateful component you can implement a convenient natively supported way to store the state. There are also third-party libraries for state management in React. Redux is a state management library inspired by Flux, but with some simplifications. The key idea of Redux is that the whole state of the application is represented by a single object, which is mutated by functions called reducers. Reducers themselves are pure functions and are implemented separately from the components. This enables better separation of concerns and testability. MobX is an alternative library for managing the state of an application. Instead of keeping the state in a single immutable store, as Redux does, it encourages you to store only the minimal required state and derive the rest from it. It provides a set of decorators to define observables and observers and introduce reactive logic to your state. PropTypes is an optional feature of React that can bring additional safety measures if you’re not using Flow or TypeScript. It allows you to define a set of validators for the props of components that will check their values at runtime. Since React 15.5 prop types have been moved to a separate prop-types library and are now completely optional. Considering its benefits, we advise to use it to improve the reliability of your application. Unlike TypeScript, which has a similar purpose, it does not require you to migrate to a new language and annotate your code for type checking to work. In Flow, type annotations are optional and can be used to provide additional hints to the analyzer. This makes Flow a good option if you would like to use static code analysis, but would like to avoid having to rewrite your existing code. All three features can greatly improve your developer experience: JSX, Flow, and PropTypes allow you to quickly spot places with potential errors, and carefully choosing your aproach to state management will help achieve a clearer structure for your project. Angular has a few interesting things up its sleeve as well, namely TypeScript, RxJS, and Angular Elements, as well as its own approach to state management. RxJS is a reactive programming library that allows for more flexible handling of asynchronous operations and events. It’s a combination of the Observer and Iterator patterns blended together with functional programming. RxJS allows you to treat anything as a continuous stream of values and perform various operations on it such as mapping, filtering, splitting or merging. The library has been adopted by Angular in their HTTP module as well for some internal use. When you perform an HTTP request, it returns an Observable instead of the usual Promise. This approach opens the door for interesting possibilities, such as the ability to cancel a request, retry it multiple times or work with continuous data steams, such as web sockets. But this is just the surface. To master RxJS, you’ll need to know your way around different types of Observables, Subjects, as well as around a hundred methods and operators. Similar to React, Angular components can store data in their properties and pass them to their children. If you need to access values in sibling components you can move it to a stateful service that can later be injected into the components. Since reactive programming and RxJS is a first-class citizen in Angular, you can make use of observables to recalculate parts of the state based on some input. This, however, can get tricky in larger applications since changing some variable can trigger a multi-directional cascade of updates that is difficult to follow. NgRx, the most popular state management library for Angular can make things easier. It’s inspired by Redux but also makes use of RxJS to watch and recalculate data in the state. Using NgRx can help you enforce an understandable unidirectional data flow as well as reduce coupling in your code. NGXS is another state management library inspired by Redux. In contrast to NgRx, NGXS strives to reduce boilerplate code by using modern TypeScript features and improve the learning curve and overall development experience. We’ve found TypeScript to be a great tool for improving the maintainability of our projects, especially those with a large code base or complex domain/business logic. Code written in TypeScript is more descriptive and easier to follow. RxJS introduces new ways of managing data flow in your project but does require you to have a good grasp of the subject. Otherwise, it can bring unwanted complexity to your project. Angular elements have the potential for re-using Angular components and it’s interesting to see how this plays out in the future. The great thing about open source frameworks is the number of tools created around them. Sometimes, these tools are even more helpful than the framework itself. Let’s have a look at some of the most popular tools and libraries associated with each framework. A popular trend with modern frameworks is having a CLI tool that helps you bootstrap your project without having to configure the build yourself. Angular has Angular CLI for that. It allows you to generate and run a project with just a couple of commands. All of the scripts responsible for building the application, starting a development server and running tests are hidden away from you in node_modules. You can also use it to generate new code during development and install dependencies. Angular introduces an interesting new way of managing dependencies to your project. When using ng add you can install a dependency and it will automatically be configured for usage. For example, when you run ng add @angular/material, Angular CLI downloads Angular Material from the npm registry and runs its install script that automatically configures your application to use Angular Material. This is done using using Angular schematics. Schematics are a workflow tool that allows the libraries make changes to your code base. This means that the library authors can provide automatic ways of resolving backward-incompattible issues you might face when installing a new version. Ionic is a popular framework for developing hybrid mobile applications. It provides a Cordova container that is nicely integrated with Angular and a pretty material component library. Using it, you can easily set up and build a mobile application. If you prefer a hybrid app over a native one, this is a good choice. If you’re a fan of material design, you’ll be happy to hear that there’s a Material component library available for Angular with a good selection of ready-made components. Angular universal is a project that bundles different tools to enable server-side rendering for Angular applications. It is integrated with Angular CLI and supports a number of Node.js frameworks, such as express and hapi, as well as with .NET core. Augury is a browser extension for Chrome and Firefox that helps to debug Angular applications running in development mode. You can use it to explore your component tree, monitor change detection and optimize performance issues. There are plenty of other libraries and tools available in the Awesome Angular list. Create React App is a CLI utility for React to quickly set up new projects. Similar to Angular CLI it allows you to generate a new project, run the app in development mode or create a production bundle. It uses Jest for unit testing, supports application profiling using environment variables, backend proxies for local development, Flow and TypeScript, Sass, PostCSS, and a number other features. React Native is a platform developed by Facebook for creating native mobile applications using React. Unlike Ionic, which produces a hybrid application, React Native produces a truly native UI. It provides a set of standard React components which are bound to their native counterparts. It also allows you to create your own components and bind them to native code written in Objective-C, Java or Swift. There’s a material design component library available for React as well. Compared to Angular’s version, this one is more mature and has a wider range of components available. Next.js is a framework for the server-side rendering of React applications. It provides a flexible way to completely or partially render your application on the server, return the result to the client and continue in the browser. It tries to make the complex task of creating universal applications easier so the set up is designed to be as simple as possible with a minimal amount of new primitives and requirements for the structure of your project. There are plenty of other libraries and tools available in the Awesome React list. Gatsby is a static website generator that uses React.js. It allows you to use GraphQL to query the data for your websites defined in markdown, YAML, JSON, external API’s as well as popular content management systems. React 360 is a library for creating virtual reality applications for the browsers. It provides a declarative React API that is built on top the WebGL and WebVR browser APIs thus making it easier to create 360 VR experiences. React Dev Tools is a browser extension for debugging React applications that allows you to traverse the React component tree and see their props and state. An important criterion for choosing a new technology is how easy it is to learn. Of course, the answer depends on a wide range of factors such as your previous experience and a general familiarity with the related concepts and patterns. However, we can still try to assess the number of new things you’ll need to learn to get started with a given framework. Now, if we assume that you already know ES6+, build tools and all of that, let’s see what else you’ll need to understand. The official tutorial is an excellent place to start learning React. Once you’re done with that, get familiar with the router. The React Router v4 might be slightly complex and unconventional, but nothing to worry about. Depending on the size, complexity, and requirements of your project you’ll need to find and learn some additional libraries and this might be the tricky part, but after that everything should be smooth sailing. We were genuinely surprised at how easy it was to get started using React. Even people with a backend development background and limited experience in frontend development were able to catch up quickly. The error messages you might encounter along the way are usually clear and provide explanations on how to resolve the underlying problem. The hardest part may be finding the right libraries for all of the required capabilities, but structuring and developing an application is remarkably simple. The framework itself is rich in topics to learn, starting from basic ones such as modules, dependency injection, decorators, components, services, pipes, templates, and directives, to more advanced topics such as change detection, zones, AoT compilation, and Rx.js. These are all covered in the documentation. Rx.js is a heavy topic on its own and is described in much detail on the official website. While relatively easy to use on a basic level it gets more complicated when moving on to advanced topics. All in all, we noticed that the entry barrier for Angular is higher than for React. The sheer number of new concepts may be overwhelming to newcomers. And even after you’ve started, the experience might be a bit rough since you need to keep in mind things like Rx.js subscription management, change detection performance and bananas in a box (yes, this is an actual advice from the documentation). We often encountered error messages that are too cryptic to understand, so we had to google them and pray for an exact match. It might seem that we favor React here, and we definitely do. We’ve had experience onboarding new developers to both Angular and React projects of comparable size and complexity and somehow with React it always went smoother. But, like I said earlier, this depends on a broad range of factors and might work differently for you. You might have already noted that each framework has its own set of capabilities, both with their good and bad sides. But this analysis has been done outside of any particular context and thus doesn’t provide an answer on which framework should you choose. To decide on that, you’ll need to review it from a perspective of your project. This is something you’ll need to do on your own. Is all of the functionality clearly defined in advance or are you expected to be flexible? If all of the features are already defined, what capabilities do you need? Will you be handling a lot of real-time event streams? How experienced are your developers and what is their background? Are there any ready-made component libraries that you would like to use? If you’re starting a big project and you would like to minimize the risk of making a bad choice, consider creating a proof-of-concept product first. Pick some of the key features of the projects and try to implement them in a simplistic manner using one of the frameworks. PoCs usually don’t take a lot if time to build, but they’ll give you some valuable personal experience on working with the framework and allow you to validate the key technical requirements. If you’re satisfied with the results, you can continue with full-blown development. If not, failing fast will save you lot of headaches in the long run. Once you’ve picked a framework for one project, you’ll get tempted to use the exact same tech stack for your upcoming projects. Don’t. Even though it’s a good idea to keep your tech stack consistent, don’t blindly use the same approach every time. Before starting each project, take a moment to answer the same questions once more. Maybe for the next project, the answers will be different or the landscape will change. Also, if you have the luxury of doing a small project with a non-familiar tech stack, go for it. Such experiments will provide you with invaluable experience. Keep your mind open and learn from your mistakes. At some point, a certain technology will just feel natural and right. This article was peer reviewed by Jurgen Van de Moere and Joan Yin. Thanks to all of SitePoint’s peer reviewers for making SitePoint content the best it can be!